Urban food forestry is planting trees in cities where people live, to provide food and many other ecosystem services. LUMES 2011 alum Kyle Clark and I conducted an open-access study published in 2013 as the first analysis of urb﻿an food forestry, finding that there is great potential to expand its reach as a strategy to increase urban sustainability. For example, of 30 urban forestry master plans we analyzed, only 13% included human food security among their objectives, while 77% included habitat for wildlife. ​We showed in a case study of Burlington, Vermont that planting apple trees could contribute enough fruit to meet the entire city's recommended intake under the most ambitious of nine planting scenarios, with substantial potential to contribute to food security even under more modest scenarios. Kyle has made a lovely website to help cities and citizens participate in Urban Food Forestry. Resources include a list of current initiatives underway worldwide, an analysis of suitable trees, resources for communities who want to get involved, and more. Slideshow with an overview and analysis of Urban Food Forestry, based on my paper with Kyle Clark. 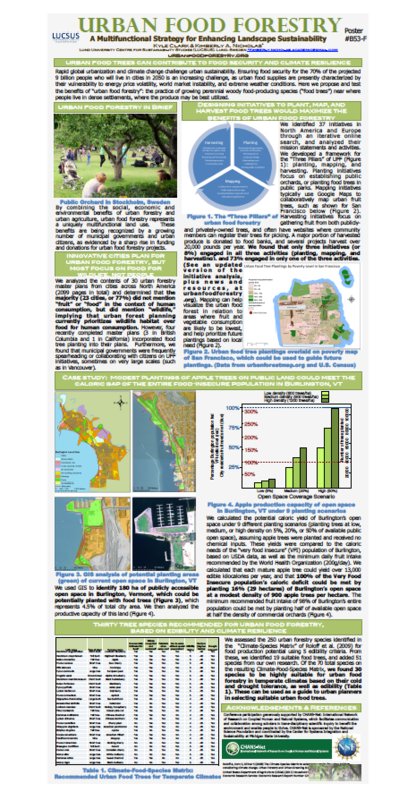 Poster presented at American Geophysical Union 2012 Annual Fall Meeting. I gave a public talk about urban food forestry at Fruktsam, a public fruit initiative started by two former LUMES students. Here's a ﻿blog post﻿ by Teresa Raucher describing the event and their work in Lund, and here's a visual story by Urban Sketchers Skåne.